To many number apps installed on PC makes the performance down. In a few click, Ashampoo UnInstaller will solve the common problem with ease. Ashampoo UnInstaller with genuine license key now free. Normal full price Ashampoo UnInstaller 7 license key is $39.95. Now, full serial license key the tool is 100% free on this giveaway. Ashampoo UnInstaller is alternative tool to Revo Uninstaller. The application remover will solve problem and remove unused third-party program on the Windows completely. Ashampoo Uninstaller is perfect tool for uninstalling software on Windows. It remove leftover files completely on uninstalling process. It also cleaning registry and disable windows services related to software removed. This tool can detect all installed software on Windows. All popular Windows version supported by this software. And now, Ashampoo Uninstaller 7 serial license key is 100% free. Ashampoo UnInstaller 7 is absolutely free but it not the latest. Ashampoo have released new version 7 of the software. Direct download link installer: Download the installer! To download the software with its license is ease just read the tutorial describes below. Download the installer Ashampoo UnInstaller 7 giveaway version from the link above. Install the software above. If it prompt you to add activation code, click on “get free serial”. Or use registration link above to register. Enter your valid email then click on “Request full version key”. Then follow the instructions. As mentioned above, the Ashampoo UnInstaller 7 is not the latest. If you want better features, buy new version Ashampoo UnInstaller 8 license key from the link below. Buy link for Ashampoo Uninstaller 8 w/ 70% Discount: Get the deals! New version Ashampoo UnInstaller 8 comes with better intelligent application monitoring. It also cleaning the leftover files and registry better. 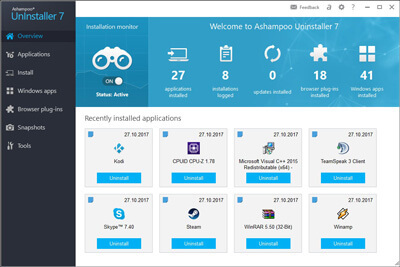 Ashampoo Ashampoo UnInstaller can be installed on Windows 10, Win 8.1/8, Win 7.